#TeamRuby helps promote our mission which is to tell the world about the healthy happy habit of hula hooping! 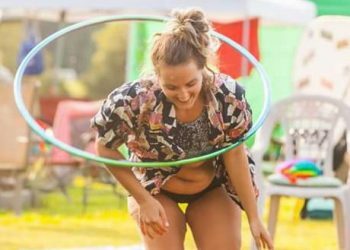 Dagny of Citrus Circles was first dazzled by hooping at Shambhala, but was unable to let it stop at that… The relationship has blossomed to full blown passion. Now, she offers hoopdance group classes and private lessons for beginners and performances within Alberta, Canada. Her goal is to teach others in a way that helps them to discover joy in the process of learning which crosses over into everyday life, and also to share her adoration of the hoop with performing. 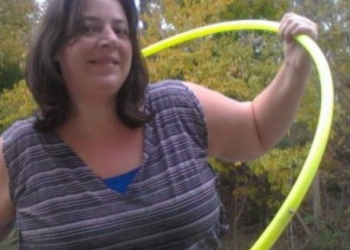 Jackie Adams is a curvy hooping super star, and been a member of the Ruby Hooping family since November 2014. She is from the midwest in Springfield, MO, and grew up with one sister who introduced her to hooping in late 2013, even gave her, her first hoop! A little apprehensive at the age of 32 when she found the circle, she excelled and now is an inspiration to thousands! She has never had a dance class of any kind or formal training and the movement she exhibits in her flow are stunning!! Jackie just recently graduated college as well with a AAS in Culinary Arts, something she has always enjoyed. When she isn’t hooping, she has a wonderful and crazy family to keep her busy! Lisa first discovered hooping at Burning Man 8 years ago. 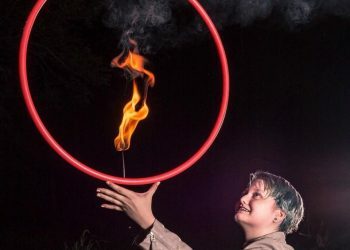 The moment she saw a girl light up a fire hoop, she knew she had to try it. A year later she made herself a hoop and never looked back. As a Colorado native, it fit perfectly with her active lifestyle, and encouraged a more healthy diet and movement regimen. She teaches hoop classes to beginner and advanced students, and is active in the Colorado flow community. She is in the process of blending her two passions together, to create unique, affordable, hand-made flow clothing for all shapes and sizes. Ashley “Smashley” Cribbs has been hooping since Sept 22, 2014. She is a world traveler and has taken her Ruby hoops all the way to Ireland, Sweden, and more! She hoops to relieve stress and anxiety, find her zen, and learn to love what her body is capable of. Ashley is also a leader in the body positive movement and helps women all over the world feel comfortable in their skin. Bleeb is from northern Ohio and has been hooping since Spring 2014! She started as a means of exercise but quickly realized it was going to be a whole lot more than that. 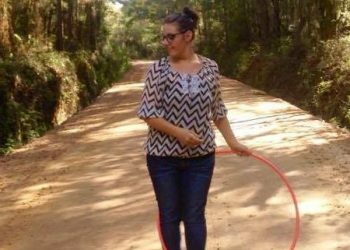 Now she can’t imagine life without hula hoops! She has gained stamina, balance, patience, health, and confidence all from a simple hula hoop. Jessie Broshart is from Pennsylvania and has been hula hooping since February 2012 and has probably not went a whole day without since! She has inspired us since we first found her on Facebook and we couldn’t wait to bring her on our team. She participates in tons of local activities such as town parades to spread the hooping love around! Kate started hooping in January 2011. She saw some girls hooping once at a Dave Mathews show, but she thought she was too big to hoop! Eventually though she was gifted a big beginner hoop and realized that anyone can hoop! She loves hooping because it’s a beautiful and healthy way to de-stress from her day to day life. She appreciates the meditative aspects as well. She truly believes that she has made great strides in her life both personally and professionally due to the positive mindset that hooping provides to her. 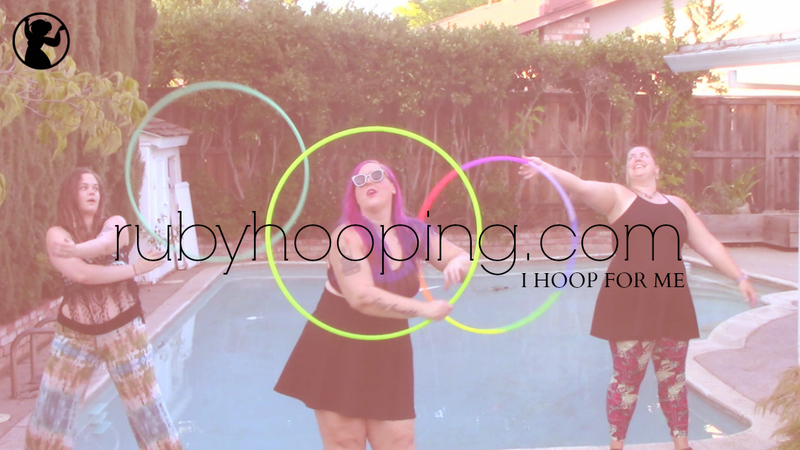 Hashley started hooping in 2014. She was first inspired seeing hoopers at a music festival called Schwagstock. Her daughter Destiny also got her into hooping; they kind of started at the same time actually! They have been hooping together ever since! 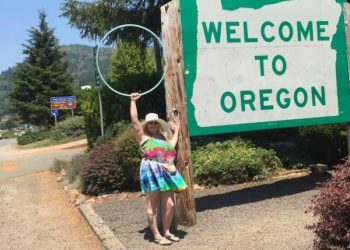 Hashley has traveled the country with her hoops and tries to hoop in as many places as possible. She has overcome many obstacles during her hoop journey, including asthma and sciatica. Many people would have quit a long time ago in her position but instead she just continues to find ways to make it all work for her. She is truly an inspiration and we are honored to have her on our team. Betheny Marie is an artist and explorer of movement born and raised in a tiny South Louisiana bayou town and now resides in sunny South Florida. 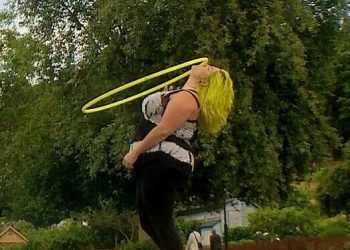 She first fell in love with hooping in the summer of 2011 after looking for fun ways to exercise. 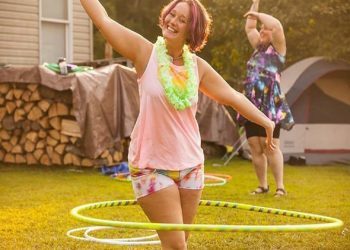 Through hooping she found an appreciation for her body and was even more inspired by all the body love she found through Ruby Hooping. 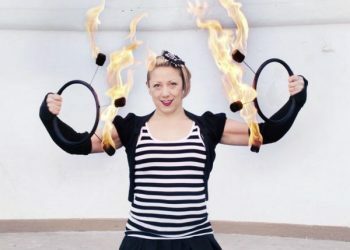 Spinning fire props and eating fire have been a part of her journey from early on. 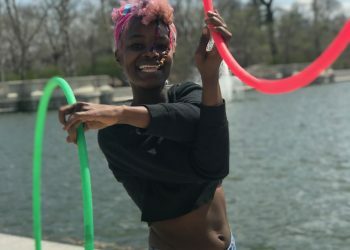 Betheny is a vegan yogi who uses hooping as a tool for self healing, meditation, and body connection. 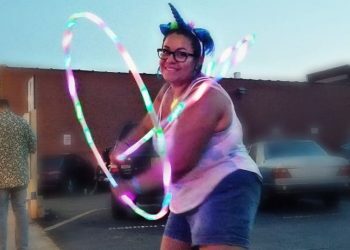 She loves spreading the hoop love at live music events and you can catch her at shows and festivals throughout Florida and beyond! Jillery Hoops has been hooping since 2009. She and her partner, Patrick Bellucci, are organizers of Rochester, New York’s weekly spin jam, Whirly Wednesday. She is very active in the Western New York flow community, bringing together Syracuse, Rochester, and Buffalo flow artists. 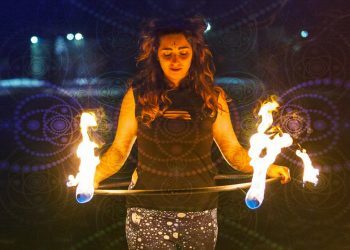 Experienced in multi-hooping, partner-hooping, fire hooping, led hooping, and black light performances, Jillery also spins other props such as fans, contact staff, double staves, silk flag poi, contact poi, buggeng, and isolation batons. Active on social media, Jillery has developed a following on Instagram (@jilleryhoops) and has a robust YouTube channel with over 50 hoop tutorials. Aurora has been hooping since 2012. She first found her way into the community through combining her two passions of photography and hooping in her 2013 Thesis at NAIT. Several of the photos have been featured on Hooping.org. Aurora began performing in 2014 at a local annual Charity Variety Christmas show. She now performs at several festivals through Western Canada with her group, Spiral Squad. Aurora completed certification as a Hoop Love Coach with Deanne Love in Summer 2017 and teaches classes at her local Community League. She specializes in Multi-hoop, Yoga Hoop Infusion, and Fire Flow. Charlotte Dillard is an Atlanta born and raised visual and performance artist. 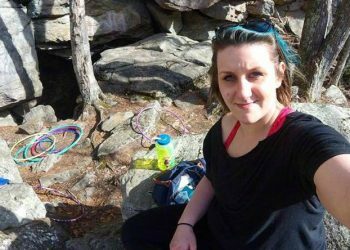 Over the last six years she has made her mark participating and performing in the Atlanta circus community, and teaching elementary age ceramics and printmaking classes. She hopes to take her enthusiasm for teaching and performing to share the love she has for visual arts and object manipulation with the world. 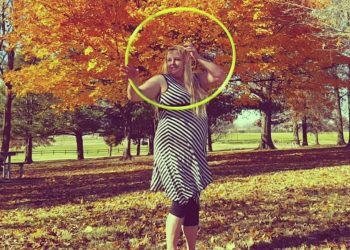 HoopsieDee (or just, Dee) is a hoop dance, burlesque/variety performer, and hoop wellness instructor. 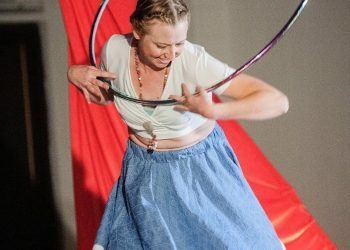 Following an Honorable Discharge from the US Navy, Dee returned home to the St. Louis area where she has been deeply involved in hoop dancing, variety acts, and stage performing for three years and continues her love for her art. She is a strong believer in strengthening the communities in which you exist, and practices this by participating in local events for benefits, charities, and kids programs. With her family by her side, she’s on a mission to help make the world a little brighter. Alex is 27 years old and currently resides in Bethlehem, PA. He loves going to festivals and spreading hoop love. He has been hooping for 5 years. Alex's style of hooping is very stylish and focused on total body movement. He also has a hip hop background which definitely influences his flow. 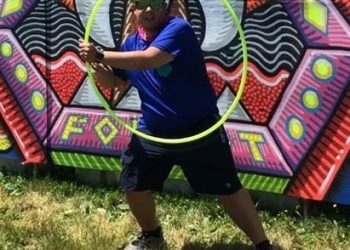 Alex first started hooping as a tool to lose weight but now it's a huge part of who he is! When Alex is not hooping, he enjoys snowboarding and traveling.